There have been several people asking questions about leveling in the new R&D system in the game. One of the more annoying things is that most people don’t realize that once you get to level 15 (The minimum level needed to craft the better gear) you still need a special R&D Duty Officer to actually start the crafting assignment. Most people don’t know what duty officer they need as the information in the R&D system doesn’t tell you. 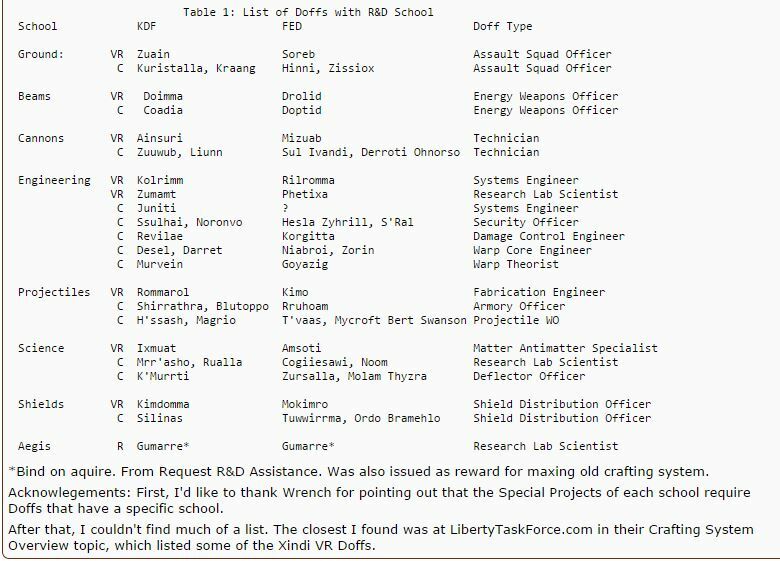 Well, here is a list of the DOFFs needed so you can craft the higher end gear once you hit level 15 in each of the schools, Fed or KDF. This is not a list I compiled. It was something I happened upon while researching the R&D system. The link to the original post can be found here . It appears to be posted by a user named HamsterChieftain. You can also check out that link if you have questions on this list. Keep in mind that the list may change over time.